Mike Desjarlais is a Sandia Senior Scientist and Fellow of the American Physical Society. Note: When the news broke that scientists at the Laser Interferometer Gravitational Wave Observatory had for the first time detected gravitational waves emanating from the collision of two blacks holes, we asked Sandia Senior Scientist and Fellow of the American Physical Society Mike Desjarlais if he’d write something for the Lab News discussing the significance of the discovery. His essay here conveys the excitement shared by physicists around the world as a new era of astronomy begins. Something really remarkable has just happened in the world of physics, the sort of thing that leads to Nobel Prizes. For the first time since their prediction by Albert Einstein in 1916, gravitational waves have been detected. On Sept. 14, the two detectors of the Laser Interferometer Gravitational Wave Observatory (LIGO), one in Livingston, Louisiana, and the other in Hanford, Washington, picked up the gravitational wave signature of two black holes in the final stages of their death spiral as they merged together, forming one larger black hole. Lasting no more than one quarter of a second and with a frequency that chirped from 35 to 250 Hz, the “sound” was that of ripples in space. Through characteristic variations in the amplitude and frequency of the wave, astronomers identified the source as two merging black holes. Located 1.3 billion light years from Earth, far outside our Milky Way galaxy, one of the black holes had a mass of around 36 times the mass of our sun, the other 29 times. The final black hole has a mass of around 62 times the mass our sun, revealing that an astonishing three solar masses were radiated away in the energy of gravitational waves. For several decades after Einstein’s calculation, there was considerable disagreement as to whether gravitational waves were real or measureable. The waves Einstein found in his calculations travel at the speed of light and alternately stretch and contract space in the directions perpendicular to their direction of travel. Picture a circle distorted into an ellipse, first along one axis and then the other. However, the magnitudes of these changes in the metric of space are so incredibly small, Einstein concluded they would never be observed. A critical advance came in 1972 in the form of an unpublished MIT lab report by Rainer Weiss titled Electromagnetically Coupled Broadband Gravitational Antenna. A young physics professor at the time, Weiss laid out a very detailed proposal to use interferometers to detect gravitational waves and provided the technical foundation for LIGO. The technology of the LIGO interferometers is a tremendous feat of science and engineering. The interferometers, each with L-shaped arms some 4 km long, are carefully tuned for complete destructive interference of the outgoing and incoming laser photons traveling between the interferometer’s mirrors. When a gravitational wave passes through the earth, the minute distortion of space between the mirrors causes a less than perfect cancellation of the light beams and produces a measureable signal. To detect the gravitational waves, the LIGO interferometers must be sensitive to a fractional change of the distance between the interferometer’s mirrors by one part in 1021. That is equivalent to changing the diameter of the Earth by something on the order of a typical atomic nucleus. In addition to their critical role in helping discriminate noise from real signal, having two detectors provides some indication as to where in the universe the gravitational waves originated. The straight-line distance between the two detectors amounts to 10 milliseconds of travel time at the speed of light. The signal observed at Hanford actually arrived about 6.9 milliseconds after the signal at Livingston. This timing difference allows the astronomers to pin down the direction of the source to a rough arc in the sky. When the European Gravitational Observatory’s Virgo detector located in Italy is finished being upgraded to higher sensitivity, astronomers will be able to use the timing of all three detectors to get a much better idea as to where gravitational waves originate. Astronomers have found convincing evidence of gravitational waves once before, without actually detecting them. In 1974, Russell Hulse and Joseph Taylor, then at the University of Massachusetts, and making observations with the Arecibo radio telescope in Puerto Rico, detected a very unusual binary system that consisted of a pulsar (a rotating neutron star that emits a beacon of light or radio waves, like a light house) orbiting an invisible dark companion, the latter revealed only by the regular periodic change in the frequency at which the pulsar light beams reached the Earth. If the theory of gravitational radiation was correct, they expected to see, over time, a gradual reduction in the orbital period as gravitational energy of the binary system was radiated away and the two objects slowly spun closer together. After accumulating data for seven years their analysis showed that indeed the decay of the orbital period was in excellent agreement with Einstein’s theory of General Relativity. Hulse and Taylor won the 1993 Nobel Prize in Physics for their discovery. The path from Einstein’s first prediction to Rainer Weiss’ 1972 MIT lab report, from the indirect evidence obtained from Hulse and Taylor’s binary pulsar to the direct detection of gravitational waves announced by the thousand members of the LIGO Scientific Collaboration and Virgo Collaboration will go down in history as one of the greatest successes of modern science and a testament to the power of international scientific collaboration. The Sept. 14 LIGO signal is the first direct evidence that black holes exist on the scale of many solar masses and can merge. Any evidence of frequency dispersion in the signal, an unexpected shift in arrival time with frequency, would hint at mass for the graviton, the theorized quantum gravitational equivalent of the photon. That in turn has implications on the possible sources of dark energy and the ultimate fate of the universe. Analysis of gravitational waves from extreme events could give clues to the quantum nature of gravity. Ideally, astronomers would like to correlate the arrival of gravitational waves with the detection of gamma ray bursts, neutrinos, or visible observations. As the number and sensitivity of these detectors increases, astronomers might be able to detect such things as quakes on neutron stars, the gravitational blast from a supernova, and perhaps the remnant waves of the Big Bang. Based on our current understanding of the universe and the likely abundance of black holes, gravitational wave astronomers are anxiously anticipating more signals in the months ahead. LIGO has already detected a second candidate event, but much weaker than the first. 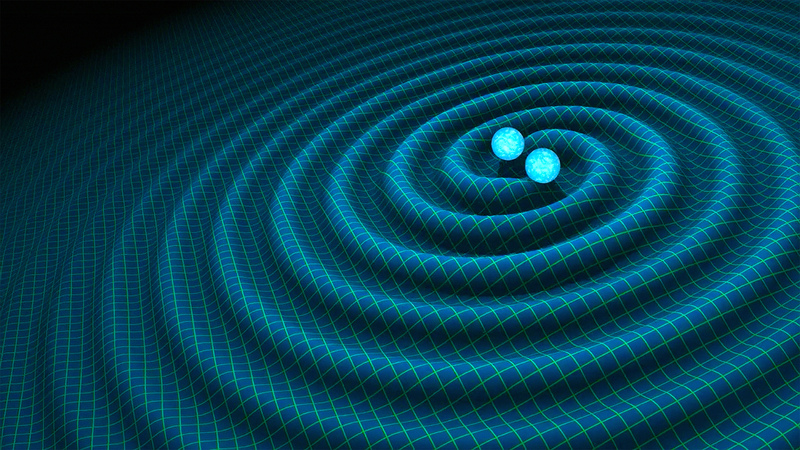 The era of gravitational wave astronomy has begun. The world now has a new way to observe the universe.